Howdy, knitting friends! 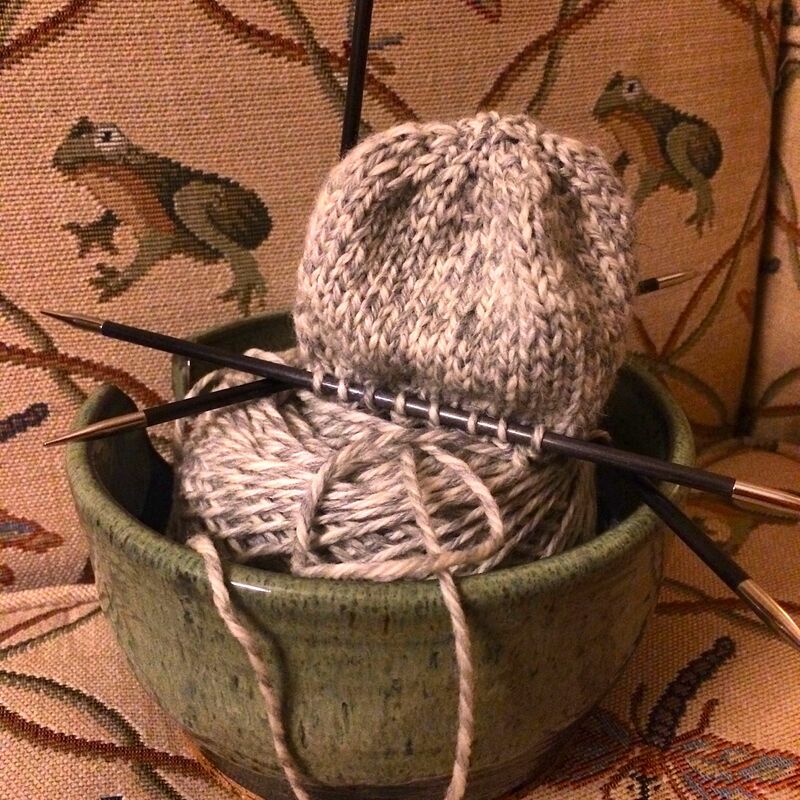 Welcome back to another post in the Knitting Daddy blog! If this is your first time visiting, I’m glad you found me, and I hope you enjoy what you read. If you’re a returning visitor, I’m so glad you came back! This week, I’m going to write about the Central Carolina Fair, which is going on right now. 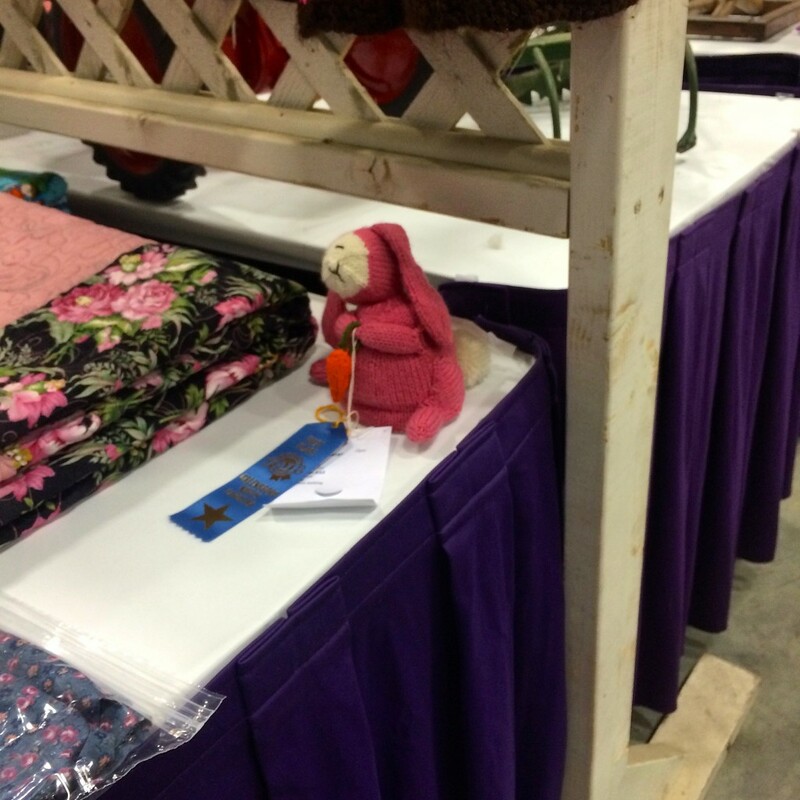 Two of my knitted items — the Pebble Beach Shawlette and the Bunny & Lamb toy — are competing. I’ll write about my experiences with the fair in a bit (hint: blue ribbons were involved), but let’s first take a look at the other knitting things that have been happening in my life the past couple of weeks. Blueberry and I check out the shawl entries and are thrilled to see the blue ribbon on mine. Since I last updated the blog, I’ve been doing a pretty good job keeping up with my podcast playlist. I’ve listened to episodes from Curious Handmade, Down Cellar Studio, Ewe University, Knitmore Girls, Knitting Pipleine, KnottyGirls, Never Not Knitting, and Yarn Thing with Marly Bird. In Curious Handmade Episode 40 (Curious Collective 2014 out very soon), Helen announces that the release of the pattern for the Curious Collective 2014 shawl. I do love knitting Helen’s shawls, and I’m going to be looking into this one closer. I wish I had more time to be able to participate in the DKAL for it that’s happening now. Maybe next time. I have a lot of deadline-oriented knitting I’m working on. In Down Cellar Studio Episode 52 (Are You Ready For Some Football? 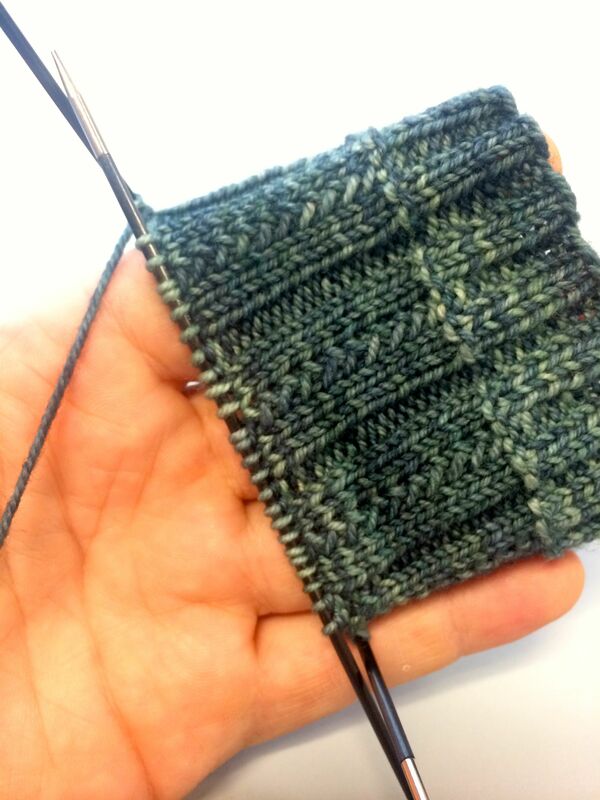 ), Jen shares a couple of cool projects coming off the needles. I think the Baby Monster is adorable, e.g. She’s also got a lot of great projects currently on the needles. What I thought was the most fun was her announcing the Instagram contest for #fallshawlstyle, where you show how you wear your shawls. So far, I’m the only dude who has entered, and I’m totally rocking the shawl I knit for my mom. In Ewe University Episode 28 (Human Aesthetic Preferences), Dr. Kelly has an extremely interesting discussion about why we prefer the things that we prefer. I think this might have been my favorite “In The Classroom” for my entire time as a student at Ewe University. It kinda boils down to the science of what we think is pretty. It was especially interesting to hear the discussion as it related across cultural boundaries. I also particularly enjoyed Dr. Kelly’s review of a book about what happens to food from the time it goes into our bodies to the time it goes out. I’m definitely putting that on my “to read” list! In my book, this is the must-listen-to podcast of the week. In Knitmore Girls Episode 297 (Fantasy Fiber League), Gigi and Jasmin continue to promote their #OperationSockDrawer contest, which is awesome. They also had a segment on blue ribbons at fairs, which I found particularly interesting since my items are at the fair this week. In Knitting Pipeline Episode 182 (Vedbaek and Pebble Beach Shawlette), Paula talks about a couple of shawls she’s been working on recently. I was especially interested in hearing her thoughts on the Pebble Beach Shawlette, since that’s one that I just finished, too. She has it “highly recommended” (as do I), and it’s neat to look at her pictures — she chose a similar colored yarn that I did, which makes me even that much more comfortable with my yarn color choice. In the piping circle, she talks about how her band swept all the categories. Congratulations! In KnottyGirls Knitcast Episode 34 (Ruining British Shows (Or Laura and Jen Think Tripp is Cool)), Laura has been dyeing a lot for her yarn clubs. They talk a little about the new season of Doctor Who, which I love. In Never Not Knitting Episode 81 (Two Little Babies), Alana talks about her exciting trip to Alaska. The story for the episode is a great, touching, story about knitting baby hats. In Episode 82 (Knitting Medicine), she talks about a cool silk yarn. In Yarn Thing with Marly Bird (the one with Pepperbery Knits Yarn), Marly interviews the owner of Pepperbery Knits Yarn, which deals exclusively in cashmere. It was a very interesting listen. Click, click, click go my needles. A few things have come on an off my needles since I last updated. The first thing I want to mention is a third hat I knitted for the Preemie Hat Drive I’m organizing in the IBK group on Ravelry. It was the charity drive for August, but there are a few more donations coming in, and I still have yarn for knitting preemie hats. I took advantage of lunchtime and breaks at work and knitted a ribbed version of the pattern I’ve already knitted two other versions of. I don’t really like knitting ribbing, but this was OK — probably because it was a small project and I can see my progress moving along pretty quickly. 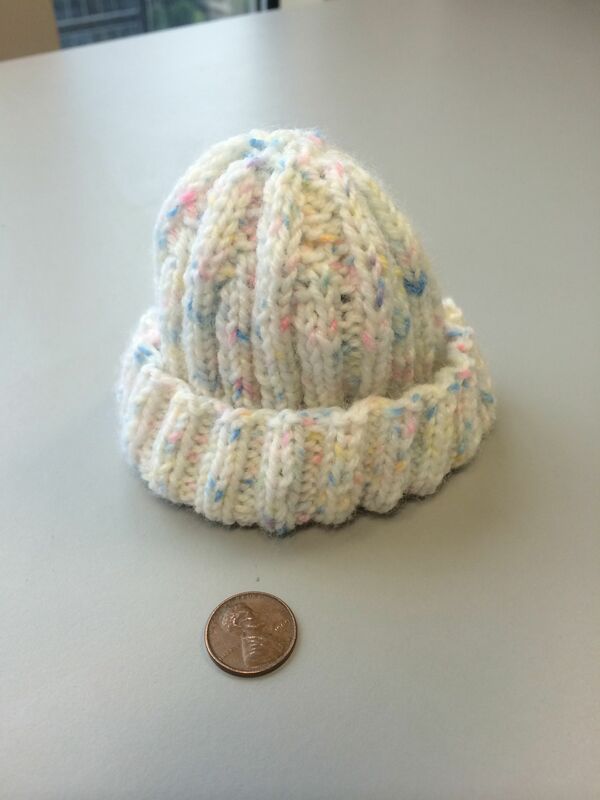 The ribbed version of the preemie hat was fun to knit. 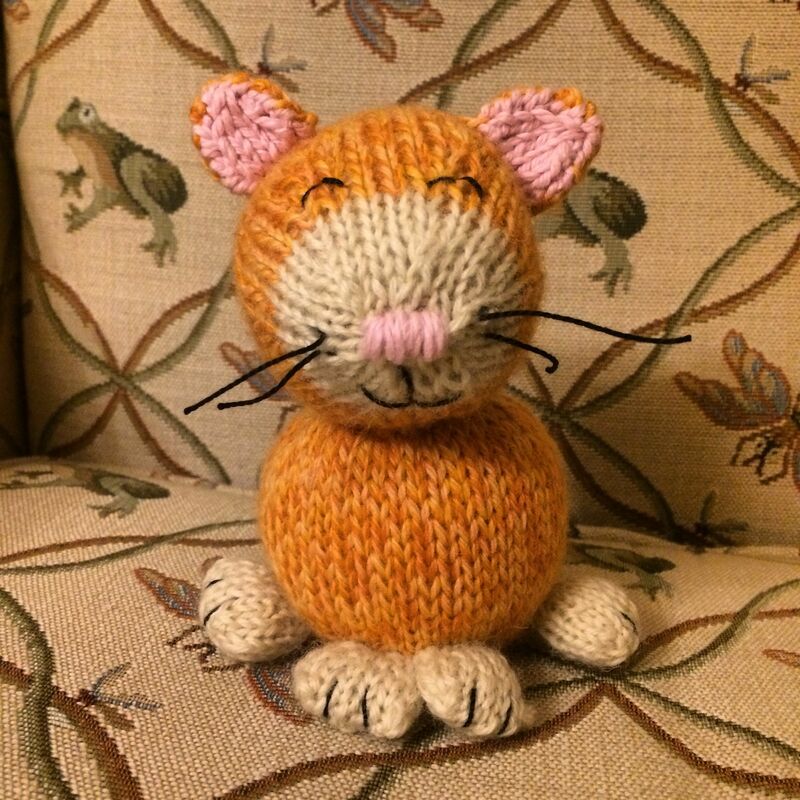 The next project I completed was the Barn Cat that I’m making as a gift for The Doubleclicks, when they come to Greensboro next month. The Doubleclicks are an awesome sister acoustic duo that sing nerdy songs. Like songs about not having to leave the house because they have cats and Netflix. Really, what more do you need? They’re on tour now, and had a spot on their web page to request what cities they should come to. I filled out the request form, and asked them to come to Greensboro. As part of that, I said I would knit them something if they came. I’m not going to say that my request is what caused them to add Greensboro to their itinerary, but a couple of days after I submitted it, they added Greensboro to the tour schedule. So I’m living up to my end by knitting them cats. I finished the first one this weekend. The second one just hopped on my needles, and I hope to finish him by the end of next weekend. I’m almost finished with Flix’s body. He’ll be a companion for Net. Since my Serenity Socks recently came off my needles, I had a set of US 1s hanging out in a lonely project bag. So I went ahead and cast on another pair of socks. I had another skein of the same yarn that I used for Mom’s Pebble Beach Shawlette, and I thought it would look good in socks, too. Instead of doing a plain stockinette pattern, I found another basic pattern to try out. It’s the Simple Skyp Socks, and it’s creating an interesting pattern as I work down the leg. I’m about 1/4 down the leg of the first sock, and it’s knitting up pretty quickly. I keep it in my desk drawer at work for knitting on during lunch and other breaks. Hopefully, I’ll finish them up in time to take them to the State Fair next month. I don’t usually enjoy ribbing, but the ribbing on these socks is pretty interesting. Hope it holds my interest for the entire project. My Local Yarn Shop (Gate City Yarns) celebrated their birthday this weekend. Blueberry and I stopped in for some cake and cookies and to check out the discounts they had on yarn. I picked up a ball of cotton yarn for dishcloth and entered the raffle they were having. Later in the day, I got a phone call from the shop saying that I won one of the prizes! 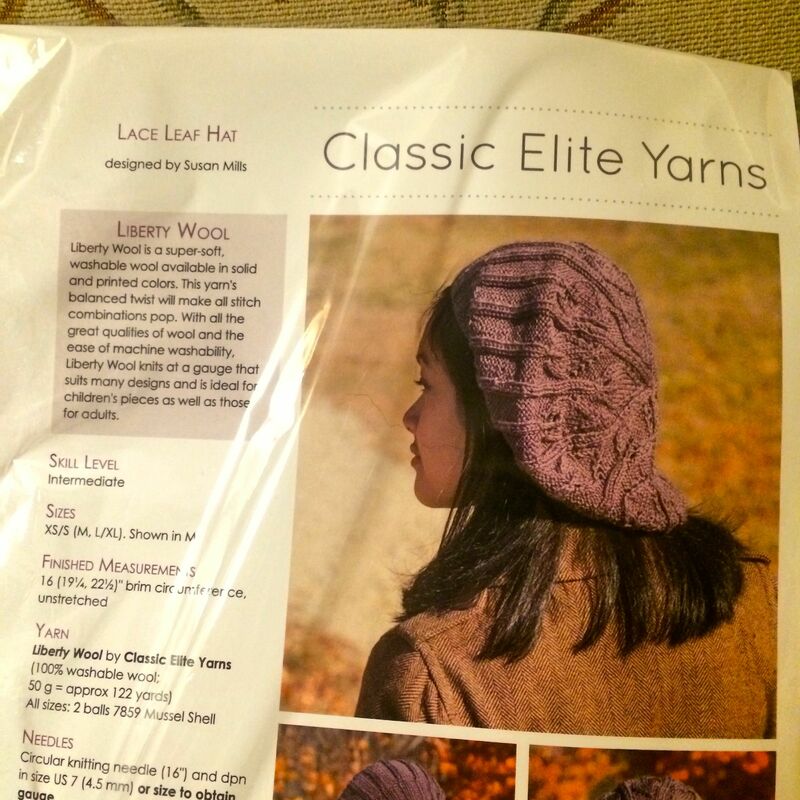 I stopped by later to pick it up and it was a pattern for a cool leafy hat, and the yarn to make it. It’s Liberty Wool yarn, which I’ve used before, and I love. I’m excited about it! I won this hat pattern and the yarn to go with it as a raffle prize from my LYS. It’s fair season! 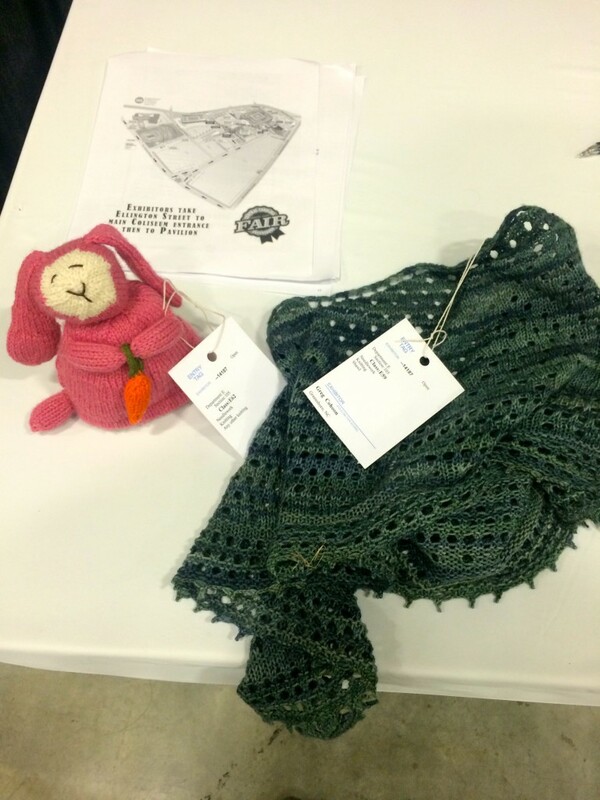 The Central Carolina Fair is this week, and I entered two of my knitted items in it: the Pebble Beach Shawlette and the Bunny & Lamb toy. This is my first time entering anything in the fair, and I was excited as well as nervous. I read the rules many times, trying to make sure I knew exactly what I needed to do make sure my items were properly entered. I headed out to the fairgrounds after work on Wednesday with everything I needed. When I got to the pavilion, there were several nice people there to help me get everything situated. Since I had no idea what I was doing, I just tried to follow the directions on the signs and ask people questions. It was great that it wasn’t busy at all, and everyone was so nice. I picked up the two tags I needed for my entries and headed to a table in the back of the room to attach them to my items. I just added the tags to my fair entries and am about to figure out who to turn them in to. Once I had my items properly tagged, I had to find the right person to give them to. That took a little doing, but I got it all sorted out and turned my items over. The lady who took them was great — she made sure they were tagged properly, that they were in the right categories, etc. I brought a hanger for the shawl, but she said they didn’t need it — they would display it appropriately. So I turned everything over and that was that. Then there was nothing more for me to do until Friday, when the fair opened. After work, I swung by the house to pick up the family and we all went to the fair. It was pretty cool that the fair entrance is through the pavilion, so everyone has to walk past the competition pieces before getting out to the midway. We made a beeline to the knitted items, so I could see how my items did. First, we saw the shawlette. I was so thrilled to see a blue ribbon on it! 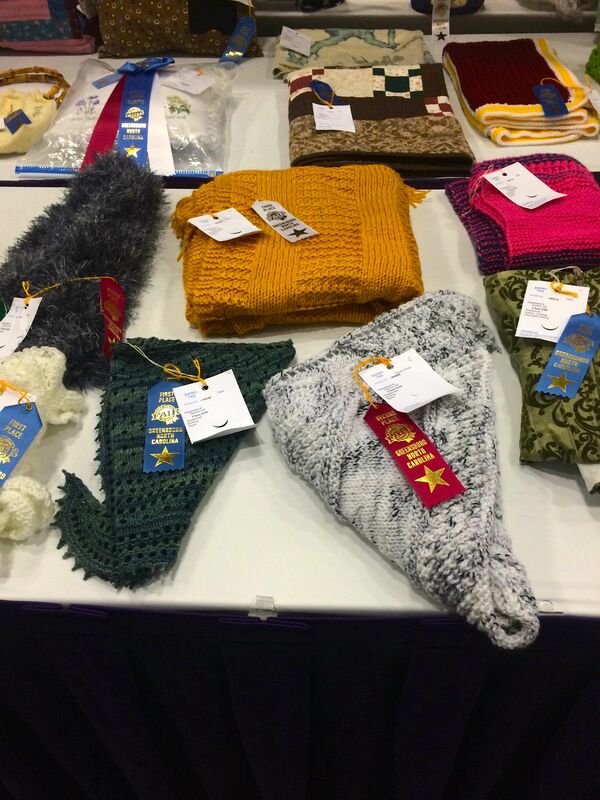 There were two other shawls next to it with 2nd and 3rd place ribbons that looked great, too. 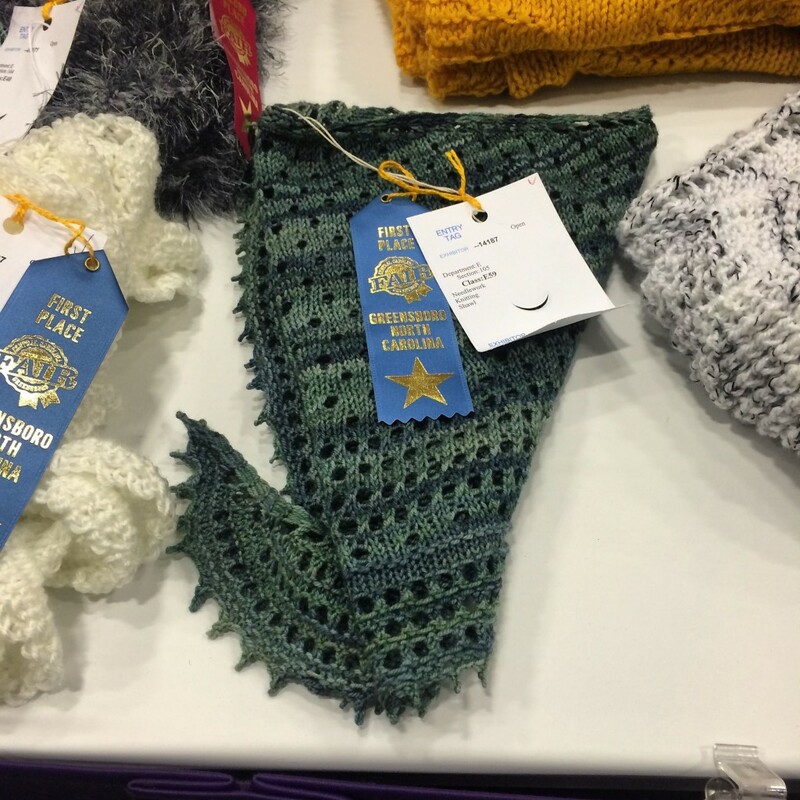 The Pebble Beach Shawlette won first prize! All three knitted shawl entries that I could find. My Pebble Beach Shawlette won the First Prize. After looking at the shawlette, I scanned the rest of the table and saw my toy at the other end. It had a blue ribbon on it, too! I’m not sure that there were any other items in its category (knitting — other), so it may have been competing against itself. Regardless, I was thrilled to see that it also won first place. My Bunny & Lamb won first prize. I’m not sure there was any other entries in his category. After looking at the knitting and crochet items, we looked at the rest of the items that had been entered. I lamented that I didn’t enter my socks — there appeared to only be 2 pair of socks entered, and they were both simple patterns like mine. I’ll definitely enter socks next year. We bought a few slices of the 1st place cakes and enjoyed a nice snack before looking at the poultry exhibits and making our way outside to the midway. Outside, we had a great time looking at the rides and finding one that Blueberry was tall enough to ride. She should be able to ride more of the next year, once she gets herself at least another 2″ of height. We spent way too much money on mediocre fair food, but it was still fun. On the way out, we took one more swing around the knitting entries. I think we’re going to go back again Friday night (the fair is free on Fridays) for a little bit. It closes on Sunday, so I’ll be able to pick up my items (and premiums!) then. I’ve already got both of those items entered in the Dixie Classic Fair next month, and there’s still time to register for the North Carolina State Fair, which I’m planning on doing. Competing in the fair is fun! Congratulations!! Wonderful post. I think competing in the fair is fun too! All year it is fun to think that a project might rise to the “special enough for the fair” level. But most importantly, I think showing your work this way is inspiring to others. I bet one or two people saw your shawl and thought, “I should learn to knit.” What fun, Greg! Thank you! Thanks, Michele! I chuckle when I think of my knitting being an inspiration for others, but sure — it was examining some preemie hats that inspired me to learn how to knit. I’m already thinking about projects I can do to prepare for next year’s fair, and compete in several other categories. Thanks, Dr. Kelly! Yes, it has definitely been a sparkly couple of weeks. 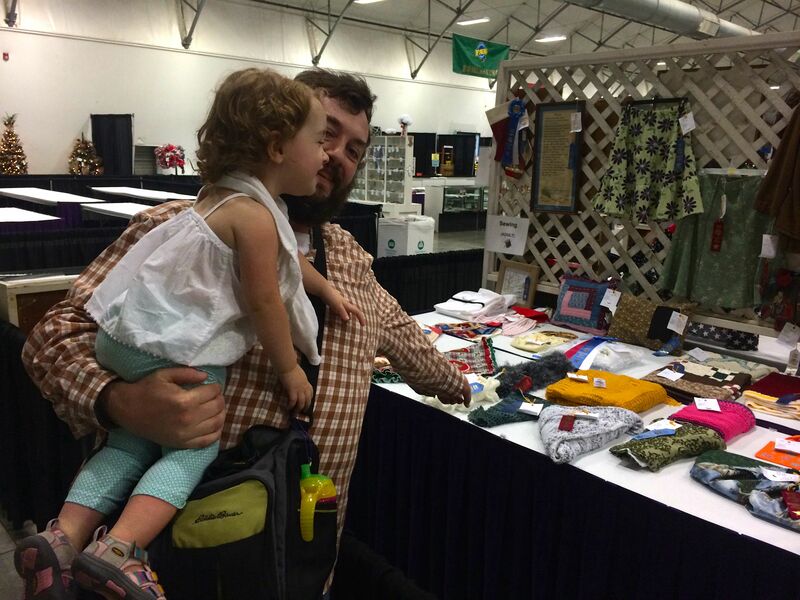 I really appreciate the encouragement you’ve given to us for entering the fair on your podcast and the County Fair Countdown thread in the Ravelry group. My success in the county fair is enough to encourage me to go ahead and enter the State Fair — deadline for entries is this Friday. Collecting the preemie hats has been a lot of fun. I need to gather everything together and arrange for a “donation event” at the hospital. I think they want to put a little fanfare around it and generate some local excitement. As always, I’m happy to give a podcast shout-out to Ewe University. It’s consistently one of my favorite podcasts, and I especially enjoyed the book review in the most recent episode. What a cool faire. I like how Blueberry is like a coconut on you. She is darling. You are a terrific dad. Ho’omaka’i on your ribbons. Super cool! Thanks so much, Kepanie! It was a cool fair, and I think we’ll go back on Friday to look some more. Blueberry is a treasure — and was quite a trooper at the fair, as we stayed a wee bit longer than she had the patience for. How exciting! Congratulations on your wins, and good luck with the upcoming fairs. Are you going to participate in Dr. Kelly’s Anomalous KAL? I think I’m going to go with the Mystik Spiral Socks http://www.ravelry.com/patterns/library/mystik-spiral-socks. I think I am going to have to pass on Dr. Kelly’s Anomalous KAL. I still have a decent amount of deadline-knitting I’m working through, and unless I can find a way to double-dip what I’ve currently got in my near-term mental queue, I’m not going to take on something new. Those Mystik Spiral Socks look awesome. I heard about them recently (on the 2 Knit Lit Chicks podcast?) and was very intrigued. I’m definitely looking forward to hearing about yours. I’ve never done toe-up, either, but I found the perfect socks to try with — the basic tube socks Jasmin and Gigi are always talking about on KnitmoreGirls (recipe in Episode 258). It’s cast-on, increase toes, rib until it’s long enough, cast off. Should be a great way to use up my extra sock yarn, too. I love trying new techniques on Blueberry since the knits are small enough that I can just concentrate on learning a new skill. As far as fair premiums go, the best I’m hoping for is to cover cost of materials. There’s no way I’d win enough to make money on these items, considering labor…. I completely understand what you mean about the full time job getting in the way! Looking forward to seeing the results of your test knitting and various KALs!